Check out the Minecraft Forum thread or join the official Discord server! Greetings, wizards! Are you looking for a magic mod for Minecraft, but don't want the hassle that comes with many of the magic mods out there? Do you want to freeze skeletons solid, engulf zombies in slime, and pull creepers into an interdimensional vortex? Do you just want a cool hat to wear? Wizardry isn't like most magic mods. It has very few crafting recipes and no complex constructions - instead, you progress by exploring and fighting. Find spell books, wands, and scrolls! Visit fellow wizards and buy rare magical items! Master the arcane and collect every single spell! ...actually, that last one might take you a while - there are currently 140 spells in wizardry and counting, and each of them is totally unique! If that's not enough spells for you, the way the mod is written allows for more spells to easily be added via add-on mods, or as I like to call them, spell packs. See below for a list of currently available spell packs. If you know how to program a Forge mod, you can even add your own! To get started, you'll need to find a magic crystal (hint: you can mine them, but there is a quicker way to find one). Craft this with a book and you'll get your very own wizard's handbook, which will tell you everything you need to know. [English | 1.7.10] Great mod showcase by Rayne giving a nice overview of the mod, along with a selection of spells, leaving the rest for you to discover for yourself! [German/Deutsch | 1.7.10] Very detailed and comprehensive mod spotlight in three parts (part 1 shown here). Many thanks to all the youtubers who have made videos featuring Wizardry! Q: "Can I use this mod in my modpack?" A: Of course you can! 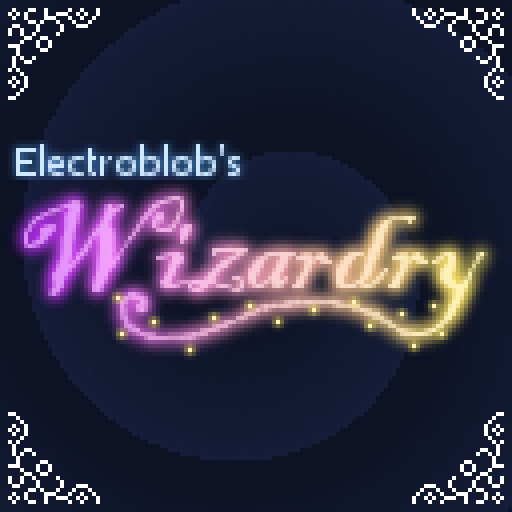 If you release a modpack containing Wizardry, you must credit me (Electroblob) and provide a link to this page. Q: [1.7.10] I installed Custom NPCs/Ars Magica 2 and the game crashed! A: Go into Wizardry's config file (or Custom NPCs' config file, either will work) and change the enchantment IDs. Please do not pester me about it! A: Update your Forge version to build 2611 or newer. Q: How do I use the transportation spell? A: See the wiki page. Q: "I disabled a spell in the config, but the book is still there!" A: This is intentional. Spell books use their metadata to specify which spell they are. When you disable a spell, the book stays there to prevent all the existing spell books from changing their spells. Don't worry, the book won't be obtainable in survival mode while the spell is disabled (unless it's already been generated), and you won't be able to cast the spell either. Q: "How do I get spell books? Nothing has a crafting recipe!" A: You have to find them! Mobs will drop them as rare loot, you can find them in dungeon chests and you can buy them from wizards, who spawn in randomly generated towers. I recommend playing wizardry alongside a mod that adds dungeons, so that there are more places to find spell books. Q: What does [insert spell here] do? A: Some of the spell descriptions are intentionally vague. If you're stuck, check out the list of spells. Q: "The spell HUD is in the way of a HUD from another mod!" A: There's a config option to change the position of the spell HUD. Click on 'mods' from the main menu, find Electroblob's Wizardry in the list and click configure. The option 'Spell HUD Position' is the one you want. Alternatively, edit the config file manually with a text editor. Q: "The crafting recipe for the blank scroll conflicts with one from another mod!" A: If you're using 1.12.2, you can change the recipe with a resource pack (I recommend adding a magic crystal to guarantee uniqueness). In earlier versions, there's an alternative recipe that can be enabled in the config, which requires a magic crystal. Click on 'mods' from the main menu, find Wizardry in the list and click configure. The option 'Use Alternate Scroll Recipe' is the one you want. Alternatively, edit the config file manually with a text editor. Q: "The game crashed! Please help!" A: You've probably heard this loads of times before, but please post your crash report, preferably using the issue tracker. I can then look at it and decide if it's a bug with the mod or not. If it is, well spotted! I will happily fix it for you. However, it may be a mod compatibility issue, in which case a fix is much more difficult - I will still give it a look though. If it happened because of a specific spell, I suggest disabling that spell for the time being, which can be done via the config. Please also make sure you have the latest version of the mod for the game version you are using - if you complain about a bug I've already fixed in a later version, I'm not going to help you! Q: "I have an idea for a spell. Can you add it?" A: Please put it in the comments! I'm always on the lookout for good ideas. If I think it's good enough and fits with how I want the mod (and is something I can program! ), I might add it. If not, someone might see it and decide to put it in a spell pack. Alternatively, if you know how to program a mod you can add it yourself - see the addon development tutorials for details on how to do this. Q: "When will you update this mod?" A: Please be patient - I develop this mod single-handedly and for the fun of it, and I've released it so the community can enjoy it as well as me. I am working on new features and release patches periodically to fix issues. I don't have the time to work on these things constantly, but please don't think the mod is abandoned if I haven't updated it in a while! Q: Can you make a version for Minecraft 1.8/1.9? Q: "Does this mod collect any data/have an update checker?" As it says in the FAQ, you are allowed to include wizardry in a modpack, so long as you credit me and provide a link to this page. You are also allowed to make videos featuring/showcasing/reviewing wizardry - in fact, I encourage you to do so! If you do make a video, it would be nice if you put a link to it in the comments so I can include it in the mod's description. Please also put a link to this page in the video description so that viewers can download the mod. You may run a server with wizardry installed, and you may make money from such a server through adverts, paid ranks, donations etc., provided that you do not sell content from the mod (such as selling spell books) or sell access to content from the mod. You may not re-post wizardry anywhere, modified or otherwise, without explicit written permission from me (Electroblob). If you wish to post the mod on a forum or repository for another country, please ask me first. You may not distribute the deobfuscated or source versions of Wizardry in any way. They are strictly for mod development purposes only, and do not come under the same licence as the mod itself. It is not necessary to include any of Wizardry's code or assets in a spell pack; if you have, you're doing it wrong! CurseForge, mods.curse.com and the Minecraft forum are currently the only authorised pages for this mod and the only pages for which I am responsible. All three pages link to the same download on CurseForge. I kindly ask that you do not download wizardry from any other website, since doing so does not support me as the mod author and downloads from such websites may be harmful to your computer. For more information and a list of websites known to repost mods without permission, go to http://www.minecraftforum.net/forums/mapping-and-modding/minecraft-mods/mods-discussion/2314237-list-of-sites-stealing-minecraft-content. You may not make money off of wizardry in any way unless explicitly stated above, be it via an adf.ly link or otherwise. I will never give permission for this to happen, and I will never put the mod behind a URL shortener myself either. If you are unsure about anything permission-related, please ask. Thanks to Minecraft Forge and MCP, without which this mod would not have been possible. Thanks also to the Minecraft modding community, which always has an answer to my modding problems! None yet... watch this space! Hey Electroblob! My Wizard God Friend! Will you add the feature called "Combine Spell Feature"? Example: I will combine Firestorm and Black Hole Spell = Fire Hole. Or, you can combine more spells and make it stronger! Sentences can be awkward using Google Translate. I have translated this mod into my language(Korean) because I want to be in your mod. Is it okay if I use this file? I translated any sentences I found except for command and config based on English. Hi, thanks for taking the time to translate the mod! It would be great to add your translations to the mod, to do this please either fork the github repository, add your translations and submit a PR, or send me the .lang file via PM on discord or using a file sharing service (such as dropbox). In future there will be versions for 1.13, yes. At the moment I'm busy adding features but once that's done 1.13 is on the horizon. As I've said to a number of people who have asked this question before, I will not be adding any more elements, whatever they are. I don't think I'd realistically be able to come up with enough spells for an air element without them feeling contrived or overlapping too much (I have enough trouble with lightning). That said, it doesn't mean I won't add more spells to the existing elements with a wind/air theme. I am also in the process of implementing support for addon mods to add elements. That's great, thanks for the info mate! I was wondering about the new element, but now it's clear to me. Should you ever change your mind, I've always had tons of ideas for air/wing magic spells. This is usually the magic I choose whenever I play tabletop RPGs based on homerules, since most setups don't include this element as another rightful member of the pantheon of elements and I always have tons of ideas, for lightning too (not contrived or overlapping :D). I joined the discord server too, is there any space to post that kind of ideas? #general is fine, or #spell-packs - I'm not too fussy about what gets put where, as long as it's relevant. I have 7 suggestions for spells. 1. Fire Rise - Note: This spell fires five flames in a U-shaped path toward the enemy. Each flame lasts for 2 seconds. The amount that the flames curve upward makes them ineffective against low-lying enemies such as Walking mobs and Flying Mobs. 2. Thunder Spear - Similar to Thunderstorm spell, but it summons 24 thunder bolts straight down at the enemy. Highly effective on large, slow enemies, especially when there is a Range Upgrade on your wand, which will double the amount of lightning to 48 spears. Fast enemies, however, can simply move out of the way to avoid most of the spears. 3. Icicle - This spell fires a short icicle that slows the enemy down. Can be considered an improved version of the Ice spell. As Blizzard spell, the area where you cast is freeze and the slow effect is only slightly weaker, Icicle is only better on powerful singular enemies, such as bosses like Ender Dragon and Wither or modded bosses. 4. Sun Burst - This spell is chargeable so you can hold the right-click mouse button like Bow Weapon. After you stop the right-click button. It creates a big ball of fire surrounds you and your enemy will cause fire damage and also the blocks too! Like Firestorm spell. It creates fire when you hit the block. But, if you didn't hold the right-click button for too long or you didn't use the chargeable thing. The burst rate is low. 5. Electric Shock - Produces 30 thunderbolts spreading out slightly at the same position one by one like Thunderstorm spell. 6. Freeze Explosion - This spell behaves like the TNT Explosion. 6 large freezing one Ice Shard will appear if an enemy enters the Caster's Range. It will explode when someone steps on it. 7. Permafrost - This spell creates blazes instead of one Ice Shard, and has tripled freezing time and increased attack. The increased freeze time makes this spell far more reliable at freezing hordes at once than Freeze Explosion, making this essentially a straight upgrade. I hope you can add it soon! A small request: it's great to have all these suggestions from everyone but if it's a long comment, please consider putting it in spoilers. Thanks! EDIT: Also this is totally out of the topic but You inserted sooo many nice spell suggestions and my question is Are they all 'yours' or you found those spells on a website? ^ That, thanks tauricus2017. I'd also add that whilst there's a limit to which and how many spells I will add to the main mod, addon devs do check this page for ideas so if suggestions don't make it into wizardry itself they may well appear in one of the community-made spell packs - so be sure to check them out! There should be a spell suggestion mega list somewhere so that these ideas don't get lost! I can't find your giant list in the discord server, is it in the spell packs sub-discussion? Sun rays. The spell summons a wide and powerful beam from the sky that burns enemies and heals fiery creatures. May melt ice and snow. Can be used during the day and in clear weather. Healing blast. It shoots a sphere that, when hit, explodes with healing energy. Deals undead damage. Magic touch. It fires a magic projectile, which, when hit by a block, breaks it and allows it to be taken as an item. Similarity of Silk Touch. Totem of Retribution. Summons a ghostly totem that heals the caster and damages undead. Ice wave. A wide bundle of icy energy kicks enemies back, deals damage and slows. Black mist. The spell is like a blizzard. Creates a smoke screen that blinds, dries, and slows down enemies. Ice sphere. It is similar to Ice Charge, but differs in that it explodes with icy energy, causing damage and enclosing enemies on ice. Ice ball. Summons a ball of ice that scatters icicles around it. Sphere of lightning. It calls a clot of electrical discharges, which moves in an unpredictable trajectory and shocks the nearest enemies. The trap for the fire. In a small radius, all burning fire is absorbed. I also propose to improve the effects of “Static Aura”, “Fiery Skin”, “Ice Skin”. If he takes damage from elemental spells whose effect is cast on a player, he will receive treatment. That Aura spell improvement sounds cool to me because of Pulse spell, but What are you expecting from a ''treatment''?